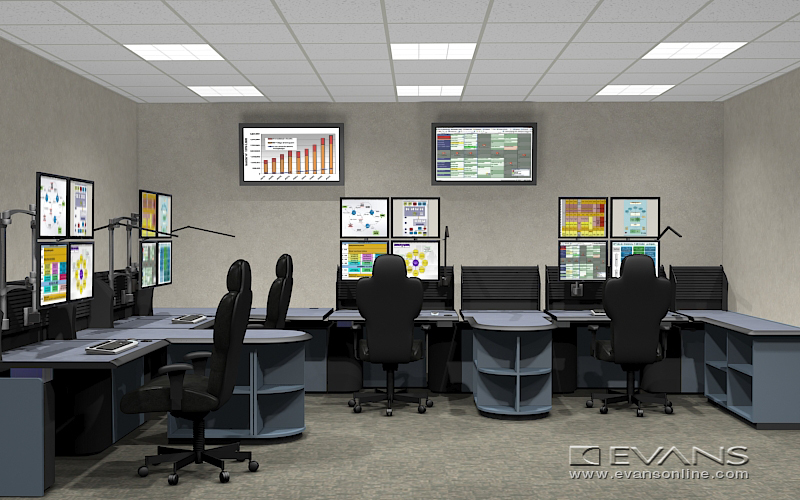 I now want you to imagine a brand new, custom designed Evans Consoles control room system that that has been purpose-built for durability in your critical environment; specialized furniture that has been designed to efficiently accommodate large quantities of computer equipment at each workstation and focused on the ergonomic issues facing a 24/7 operation. Your new Evans Consoles environment eliminates the desktop clutter and enhances the work environment by providing a place for everything and putting everything in its place. And, last but not least, your new control room has been custom designed to be a one-of-a-kind environment, finished in your choice of over 60 standard laminate colors and wood veneers or a virtually unlimited number of custom colors. It’s truly the showpiece of your organization; a room that will impress visitors, clients, investors, employees and management. All of this is a lot easier than you might think. 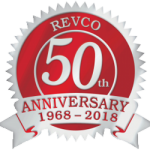 We’ll start by discussing your thoughts and requirements for your new control room as well as evaluate the room in which the system will be installed. I’ll then work closely with my colleagues in the Evans Solutions and Design Team to prepare drawings that will help you visualize the proposed layout. We’ll next discuss the plan to determine if changes such as additions, deletions and other modifications to the design are needed. When the final configuration is determined, we’ll provide you with a detailed proposal and 3D renderings. Start to finish, the design phase could take as little as 2 weeks. Once you fall in love with what you’ll see and your order is processed, the average time to manufacture the furniture is about 6 weeks. When your new furniture is ready to go, it will be packed and shipped directly to your facility by a dedicated carrier. While in transit, you’ll be contacted to schedule an installation date. In most cases, installation is usually completed in just one day. When our factory trained and certified installers are finished, your new command console will be ready to accept your hardware and equipment. Your employees can get to work in a new, comfortable, ergonomic and beautiful work environment. 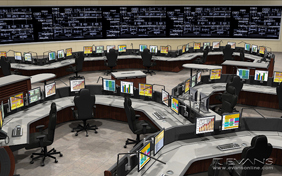 Would You Like to See How Your New Control Room Will Look Before We Even Begin? Being able to visualize exactly how your new room will appear is very important in helping you make the right decision. As part of the project planning phase, you will receive a complete set of drawings illustrating your layout. But, let’s face it, drawings can only go so far. They can provide a general idea of the layout, but they don’t offer a realistic view of the room. So, in addition to the drawings you’ll receive, we’ll also provide you with a set of photo-realistic 3D renderings prepared by the Evans Consoles’ award winning Imaging Team. You’ll be able to see your proposed layout, in the colors you selected, exactly as it would appear if you were standing right there in the room. I’m not talking about some simple 3D drawings. We’ll provide images of your room that you’ll swear are photographs. They are an absolutely amazing tool that allows you to show management and staff exactly what you are planning and then get feedback so you can “fine tune” your layout to be perfect in every way. We offer a virtually unlimited number of color and finish options from which to choose. You can pick from our selection of more than 60 standard laminates and wood veneers options. You can even order any number of exotic wood species to make your control room as beautiful and unique as possible. In addition, should you have, say, a color scheme that you want to include in your new command console, we can match those colors by locating the appropriate laminate materials from Evans’ laminate supplier. Finally, we can even include an inlay of your logo right in the panels or work surface of your new furniture, or, add spectacular lighting enhancements to really make it “pop”. It’s the perfect way to customize and make your control room truly unique. So, feel free to get creative and make your new environment an exciting, fun and enjoyable place to work. As the industry leader, Evans Consoles has spent years designing and developing unique products and features. For example, all work surfaces are edged with Evans’ patented waterfall nosing which is comprised of soft, molded urethane over extruded aluminum. This feature improves wrist comfort by eliminating contact stress. As an added benefit, the soft edging also protects the work surface from damage by chairs that get carelessly pushed into it. It is a unique feature that you will not find anywhere else.